There are laws in place to allow retired LEOs to carry across jurisdictions. There is also this law that was passed. What about if we found a few lawmakers to introduce a bill about allowing Distinguished Pistol Shots to carry in a similar manner? If done correctly, this could have bipartisan support. I would wager that there are few groups in the country more patriotic, more capable, and with a higher regard for safety. I understand that the legislation listed above is very specific and limited. However, the current number of Distinguished Pistol Shots is small in number per capita. It may be the type of thing that would initially be able to remain low profile. If the proposed legislation passed or gained national attention, it could be an idea that greatly increases the number of people trying to achieve the distinction of Distinguished. We have a large list of guns on the approved list, and we have cut scores in place. The nature of the badge itself and its history would be maintained. We should not need additional pieces of legislation to enjoy our rights, but this could be a good option that might pass or at least generate more interest in our sport. 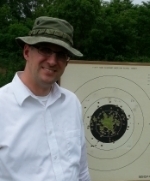 davekp wrote: Why draw the line at Distinguished shooters? Why not include High Masters? Or Masters? Or Experts? Or Sharpshooters? Or Marksman? There are a couple of reasons why. First, service pistol shooters could actually carry their competition guns. The guns are iron-sighted and fire defensive types of ammo. Secondly, the CMP has a Federal relationship. The classifications you mention are NRA. I would prefer to not have the NRA associated with this legislation at all. NRA bills are higher profile. Most of the guns used in NRA matches aren't what I would call defensive in nature. BE Mike wrote: It is one thing to shoot at targets with one hand in competition. It is quite a different thing to train for fighting situations. It is apples and oranges. All the Distinguished Pistol Shots I know living in states where people can reasonably get permits have them. I suspect that DPS living in states where people cannot reasonably get permits want them and would be trained accordingly. I'm also not too thrilled with the idea, that someone who fifty years ago, managed to hammer out a distinguished pistol badge in a military competition, should now, at the age of 85 be granted the privilege of national concealed carry because, he or she at one time, in the distant past was an adequate shooter. Is your 85 year old a law abiding citizen? If so, he or she could probably get a series of permits to carry now. People have rights. Some states recognize them fully. Other states recognize them to a lesser extent. Some states don't recognize them at all. We have had some recent SCOTUS rulings that stop states from limiting basic human rights. I say piggyback on that effort. It would be my goal for people able to carry to be free to carry in more places if they were a DPS. It would be a beach head toward more freedom. There are many legislative wrongs. We cannot right the world with a single piece of legislation. However, this effort could play within the rules while we also work to change the rules. "Is your 85 year old a law abiding citizen? If so, he or she could probably get a series of permits to carry now. " I am sure they can. That was never my point. I am not in favor of giving anyone special privileges based on who they once were, or what they once did. If anyone has to take a test, everyone should have to take a test. Equal protection, and all that crazy constitutional nonsense. Yeah, this isn't going to a good place.....not at all.